Incredible investment opportunity or second home...over $115K in rents for 2018!!! 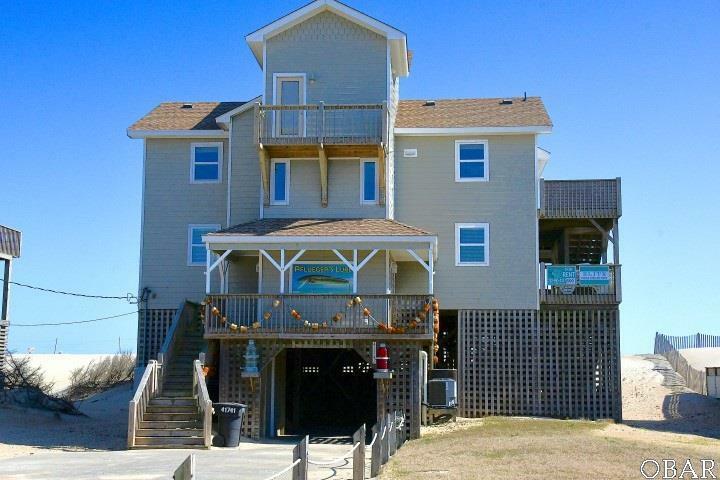 This 6 bedroom, 6 1/2 bath, oceanfront cottage is full of coastal charm and personality!! Boasting panoramic views, an elevated heated pool, hot tub, direct access to the beach, and an outdoor fish cleaning station -- it is a beachgoers dream!! Under the house there is covered parking for two and just off the parking area a ramp leads to the elevator, which stops at every floor. The second level houses 3 king masters (each with direct access to the pool deck) and a twin bedroom with a full size bathroom. The landing between floors offers a half bath for convenience. As you move up to the third floor, you are greeted by a large and open floor plan with beautiful panoramic ocean views, large windows allowing ample natural light, and a beautiful exposed beamed cathedral ceiling. The fully- equipped coastal kitchen includes extensive counter space, a small breakfast area with bar-height seating, and a large dining table that seats 10. A 5th bedroom is also on this floor and features a double bed with upper deck access. Move upstairs from the main living area to the loft to find another master bedroom -- complete with its own private balcony!! Large ocean side sun and covered decks border all levels of the home. With close proximity to area restaurants and popular attractions of the Cape Hatteras National Seashore, Pflueger's Lure is a unique find! !